Above is a photo of Uroctonites huachuca a rarely seen scorpion found at high elevations in southern Arizona. 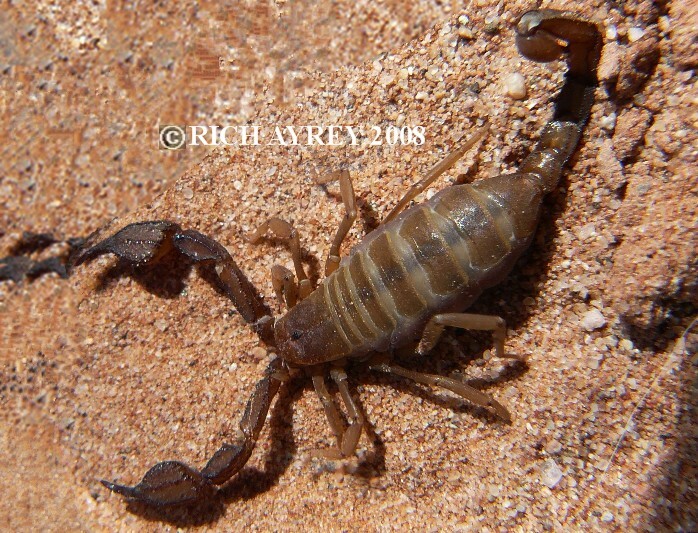 This scorpion was found at 7380 feet elevation in the Huachuca mountains. I am fortunate to have available pics of this species of Arizona Scorpions. Here is a pic of the same Arizona Scorpion, taken 7/24/08 with first instar young on her back. Here is a pic of a Uroctonites huachuca, taken 06/19/10, from the Santa Rita Mountains. This photo courtesy of Casey from Tucson. Arizona Scorpion World page created 05/09/08.